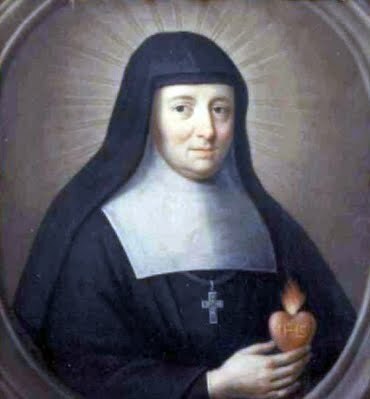 August 12 - Saint Jane Frances de Chantal, Religious - Optional Memorial - My Catholic Life! Today’s saint was well born and acted like it. She was educated, refined, beautiful, witty, and wealthy. She married a baron, lived in his castle, and together they raised four children. But then tragedy struck like lightning. Her husband was killed in a hunting accident. Jane was a widow at just twenty-eight. She found it nearly impossible to forgive the man who had caused her husband’s death. Her anger was eating her up from the inside out. But in 1604 she heard a homily that she needed to hear, from a wise, holy bishop who spoke with great erudition, passion, and eloquence. It was the great Saint Francis de Sales on one of his endless tours across southern France. This time he was in Dijon, in Jane’s territory, and she saw in him the embodiment of the spiritual guide whom God had promised her in a mysterious vision. The two bonded in a holy friendship not unknown among the saints and remained close until de Sales’ death. Jane de Chantal wanted to become a nun, but Francis dissuaded her… for the time being. Once she had provided for her children and taken care of various practical matters, she was finally ready to uproot herself and move to Annecy, near Geneva, Switzerland, to start a Congregation of religious sisters. Her fourteen-year old son was perplexed at his mother’s decision to leave him for God, even though Jane had placed him in the care of her brother, a bishop. In one of history’s most poignant, yet humorous, illustrations of Christ’s commandment to leave father and mother and wife and children for Him, the boy dramatically blocked his mother’s leaving for the convent by laying on the floor across the threshold. A priest in the room asked Jane if her son’s tears would change her mind. “No,” Jane replied, “but still, I am a mother.” She cried, stepped over her son, and left. Moved? Yes, definitely. Deterred. No. Not in the least. Jane Frances de Chantal founded the Congregation of the Visitation in 1610. Its sisters were often women who had been unwelcome in other religious congregations due to illness, age, or the inability to live the strict life of penance and fasting required in most convents. The Visitation nuns’ initial active apostolates were eventually curtailed in favor of a cloistered existence based on the traditional rule of Saint Augustine. Saints Francis and Jane prized two virtues in their nuns above all others: humility and gentleness. The Annecy Visitation Convent grew into a magnet for aristocrats, princes, and princesses attracted to Jane’s practical savoir-faire, charm, gentility, and holiness. After the death of Saint Francis de Sales in 1622, Jane destroyed all of the correspondence they had exchanged over the years. They were truly co-founders of the Visitation order and spiritual twins. Incredibly, Saint Vincent de Paul replaced Francis as Jane’s spiritual director. Jane grew in holiness behind the walls of her cloister and developed a reputation as a saint, one which she rejected. After many physical and interior sufferings, she died a holy death, was beatified in 1751, and canonized in 1767. She was indeed rewarded by Christ a hundredfold for having cut her ties to her family. There were eighty-six Visitation convents established by the time of Jane’s death, and the order continued to expand after she died. Visitation convents are still present in many countries throughout the world. Saint Jane Frances de Chantal is buried in a sumptuous golden tomb in the Visitandine church in Annecy, just a few feet from the tomb of her holy mentor, Saint Francis de Sales. Saint Jane Frances de Chantal, your commitment to God grew out of grief over your husband’s untimely death. May we convert every sadness, loss, and trial in our lives toward the good, redirecting our hurts into an ever more intense love of God. AT the age of sixteen, Jane Frances de Frémyot, already a motherless child, was placed under the care of a worldly-minded governess. In this crisis she offered herself to the Mother of God, and secured Mary’s protection for life. When a Protestant sought her hand, she steadily refused to marry “an enemy of God and His Church,” and shortly afterwards, as the loving and beloved wife of the Baron de Chantal, made her house the pattern of a Christian home. But God had marked her for something higher than domestic sanctity. Two children and a dearly beloved sister died, and, in the full tide of prosperity, her husband’s life was taken by the innocent hand of a friend. For seven years the sorrows of her widowhood were increased by ill-usage from servants and inferiors, and the cruel importunities of friends, who urged her to marry again. Harassed almost to despair by their entreaties, she branded on her heart the name of Jesus, and in the end left her beloved home and children to live for God alone. It was on the 19th of March, 1609, that Madame de Chantal bade farewell to her family and relations. Pale, and with tears in her eyes, she passed round the large room, sweetly and humbly taking leave of each. Her son, a boy of fifteen, used every entreaty, every endearment, to induce his mother not to leave them, and at last passionately flung himself across the door of the room. In an agony of distress, she passed on over the body of her son to the embrace of her aged and disconsolate father. The anguish of that parting reached its height when, kneeling at the feet of the venerable old man, she sought and obtained his last blessing, promising to repay in her new home his sacrifice by her prayers. Well might St. Francis call her “the valiant woman.” She was to found with St. Francis de Sales a great Order. Sickness, opposition, want, beset her, and the death of children, friends, and of St. Francis himself followed, while eighty-seven houses of the Visitation rose under her hand. Nine long years of interior desolation completed the work of God’s grace; and in her seventieth year St. Vincent of Paul saw, at the moment of her death, her soul ascend, as a ball of fire, to heaven. Reflection.—Profit by the successive trials of life to gain the strength and courage of St. Jane Frances, and they will become stepping-stones from earth to heaven.